COEUR D’ALENE, Idaho (June 29, 2014) – Andy Potts (USA) displayed poise and brilliant race tactics, while Heather Wurtele (CAN) was unmatched on the day as both earned wins at the twelfth edition of IRONMAN Coeur d’Alene with times of 8:25:44 and 9:34:32, respectively. Andy Potts (USA) set the tone quickly in the race when he pushed his way to front of the swim group in the choppy and windy conditions on Lake Coeur d’Alene. Pacing the entire swim, Potts established a solid lead of over five minutes on Viktor Zyemtsev (UKR), Maik Twelsiek (DEU) and defending champion, Ben Hoffman (USA). Once on the bike Potts held off the chase pack of Zyemtsev, Twelsiek and Hoffman for the first half of the ride. The trio started to make small gains into Potts lead but nothing substantial until around mile 75 when the field bunched up and Twelsiek forged his way into the lead. Zyemtsev was first to fade from the pace as Potts settled for keeping Twelsiek close with Hoffman looking strong and closing the gap to only a minute on the lead pair. 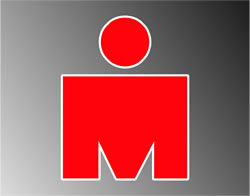 Hoffman became entangled with an age group athlete who was blown into Hoffman’s path and the pair went down at mile 95. 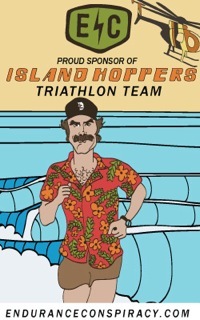 After aiding the age grouper and repairing his bike, Hoffman got back on course. Up front, Twelsiek made his move and extended his lead over Potts to two-minutes at the completion of the bike. 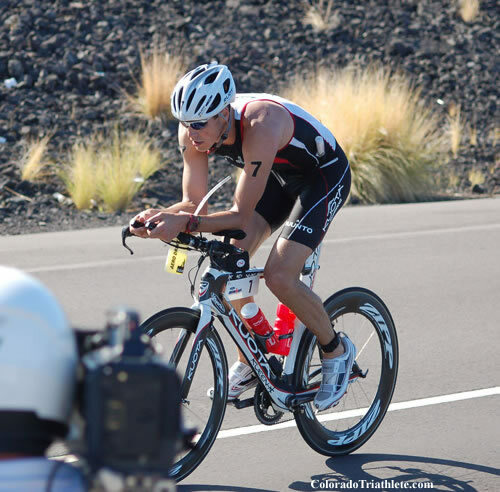 Zyemtsev was next into T2, 11 minutes off the leaders pace, as Hoffman was facing nearly a 14-minute deficit. As the race hit the run, Potts immediately started chipping away at Twelsiek’s advantage and grabbed the lead shortly after the first five miles of the run. Zyemtsev and Hoffman were flying, but not making the gains that would net the multiple IRONMAN champions the win. As the race reached the second half the run, Potts’ lead grew to five minutes on Twelsiek, who now had Zyemtsev in his shadow, while Hoffman ignored the bruises and abrasions as he worked his deficit down to less than eight minutes. At mile 21 of the run, Potts had the field closing in on him hard and fast with Zyemtsev just over two minutes back and Hoffman at less than five minutes from the front-runner. It was then, Potts turned on the jets and rolled out four consecutive six minute miles as the pair behind him could only match the pace. 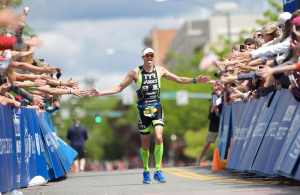 Potts was able to let off the throttle as he neared the finish and went on to capture the 2014 IRONMAN Coeur d’Alene title in a winning time of 8:25:44. 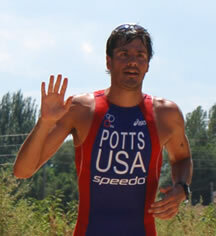 It was Potts second victory in Coeur d’Alene as he also won in 2010. Veteran Zyemtsev had left his move just a little too late, coming up short by 2:48, but still grabbing second with a finish time of 8:28:32. Hoffman had a bittersweet and well-earned third place finish with his 8:29:12 clocking. The women’s race saw Kelly Williamson (USA) run up the sandy beach of Lake Coeur d’Alene first with Jessica Jones (USA) and Heather Wurtele (CAN) trailing by 42 and 45 seconds as the leading trio had the remainder of the field over six minutes back. Wurtele put on a display of her bike prowess and quickly grabbed the lead. Almost immediately she built upon her advantage with each passing time check. By mile 35, Wurtele’s lead had swelled to 7:30 and 12 minutes on Smith and Williamson. At mile 80, despite suffering a flat, Wurtele had built enough cushion to still enjoy a 7:30 lead once she was back on the bike. Coming off the bike, Wurtele continued to hold the lead on Smith and Williamson. Once on the run, Wurtele cruised the marathon and on to a successful defense of her title with a 9:34:32 finish time. Williamson ran her way past Smith and into a second place finish with a time of 9:50:07. Smith rounded out the podium with a 9:58:42 finish time.